Win $800 in Avery School Supplies from On Time Supplies! 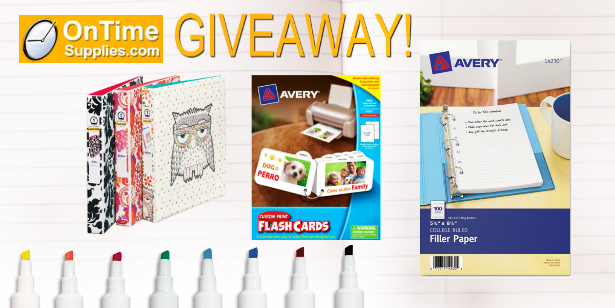 Avery Prize Package: $800 in Avery Binders, Dividers, Dry Erase Markers & more! I'm not sure which part of the prize package I like more: the totally adorable mini binders, or the the always handy index divider sets. Lucky for the winner, he or she won't have to choose! (4) Mark-A-Lot Dry Erase Markers 24-Count Value Packs, Black & Asst. No purchase necessary to win free school supplies from On Time Supplies. Remember, you get on entry for each subscribe & share combo. So do them all for up to five chances to win! All my students are special to me, each one brings special gifts and talents to our class. Mrs. Payne, She teaches Preschool and is fantastic with the children. All of my students are special to me, each one is special in their own right. I am blessed everyday to have each and every student in my life. my favorite student was a girl named Liz who made each day in class special. I don’t have one favorite student, there are all special to me. my favorite teacher was my gifted teacher, i had her from kindergarten through fifth grade. she treated us like her own children. My favorite teacher was my daughter’s kindergarten teacher. She was so patient and hilarious! I loved volunteering in the classroom because of how much fun she made learning. Following on Google and Facebook. Shared your post on Facebook, Google, and retweeted. I retweeted on twitter (LuckyDuckyToo). Mr. Hansen, my favorite teacher, was always so helpful and present during class, took the time to explain concepts that were hard to grasp. My favorite teacher was Mrs. Smith, my 3rd grade teacher. It was her last year before retirememnt and she made it a special and memorable year. I followed on twitter @eswright18 and RT’d. My favorite teacher was Mrs. Wood. She was my 3rd grade teacher.